Taking advantage of the nearly Spring like conditions present on Sunday I ventured into Midtown, Manhattan. My goal was to visit the ICP – International Centre of Photography. But, I also decided to enjoy the day and explore the general area. It was through my exploration I came across the Chicago Girl. Allow me now to digress and explain how I encountered her. After taking time to visually digest the numerous photographs and journals of Robert Cappa on display at the ICP, I took the time to walk about and enjoy the ever hectic pace of the city, NY City. I chose to wonder about feeling confident in the fact that wherever I ended up, my smart phone would help me get out of it again – provided it had sufficient power. Five minutes later, after a pleasant stroll following the crowds of people walking about and making their way through the city, I landed in Times Square. Or rather, Times Square landed on me. It never ceases to amaze me how much activity occurs at that one spot in Manhattan. It is overwhelming, and it is not just the numerous tourists and vendors who trade in the area but also various performers – in costumes, with musical instruments, with flyers – all trying to garner some attention to what they are providing. It is a Mecca of distraction, but in so doing it is also vastly entertaining. It is among these street performers I met the Chicago Girl. I refer to her as the Chicago girl as she was handing out flyers for that well known Broadway play that goes by the same name – Chicago. And, like the actors who play on Broadway, she was handing out flyers while moving in a well crafted, choreographed manner. That, I think, is what caught my attention – that she would put that much effort into distributing flyers. And, at that point, I couldn’t help but take photos of her in her street performance. Because of the hustle and bustle of so many persons walking by, it was hard, no difficult, to capture her. To make things even more frustrating, the one lens I could have used to have a more isolating effect – my 55-200 mm lens – was left at home to save weight. So, for a moment, I was fighting an uphill battle. That is, until, the crowd parted just enough for me to capture her and her alone on the street doing her usual performance. I caught the photograph in this post in an experience which can only be communicated as Henri Cartier-Bresson’s “Decisive Moment”. Without a doubt I really enjoyed my Sunday tour of the city. I enjoyed the visit to the museum, the crowds, the activity. 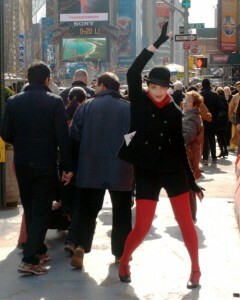 I enjoyed the street performers and yes even the visitors made the experience welcoming. But, overall, I have to admit, the Chicago Girl made the experience all the worthwhile.